ARS RELEASES FIRST OFFICIAL LIVE CONCERT DVD! 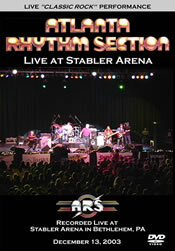 "The Atlanta Rhythm Section - Live at Stabler Arena"
For more than 30 years, members of The Atlanta Rhythm Section have entertained audiences all over the world with their outstanding form of classic rock/southern rock music. They've enjoyed hugh popular hits that include "So Into You", "Champagne Jam", "Imaginary Lover", "Not Gonna Let it Bother Me Tonight", and "Spooky" - but there's so much more! With 15 albums of outstanding songwriting and performances to their credit, The Atlanta Rhythm Section represents all the good things the phrase "classic rock" implies. Since the the release of their last CD, Eufaula, they've been playing shows all across the United States - continuing to impress audiences with their high quality music and their high energy live performances. In December 2003, the "Georgia Rhythm" traveled to Bethlehem, PA for a unique performance at Stabler Arena, a 6,000 seat high-tech concert arena located on the campus of Lehigh University. Joining ARS and the high spirited crowd at this seasonal event was a camera crew and a mobile digital multitrack audio recording unit from Rolling Storm Communications Corporation - a production company who's collaborated with ARS on various projects over the yearIs. INTERESTING NOTE: ConcertVideo411.com has a added couple of articles to its site discussing background details of how this ARS DVD was produced. 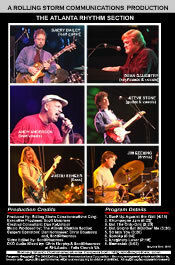 Check it out at: ConcertVideo411.com and look for Example Productions to see articles on Atlanta Rhythm Section. Recorded Live at: Stabler Arena in Bethlehem, PA - December 2003 . This live concert DVD features eight songs that span six different albums and includes some of their biggest hits (with three songs from the Champagne Jam album). The high-powered performance showcases the great music that ARS has created over the years, demonstrates what a talented musical ensemble they continue to be, and leaves any fan (long time fan or new fan) wanting more. 1. Back Up Against the Wall - The boys kick off the show with this high powered tune that has served them well as an opener since the early days. Andy carries the lyrics over a driving beat that leads to a classic instrumental finale - let's rock and roll! 2. Champagne Jam - There is no doubt - this one's a classic. They're playing up a storm, trading licks, and jamming all night long. Andy hits the high notes and everybody takes a turn soloing - proving, once again, that these guys can really play. 3. Not the Only One - A featured song from the "Eufaula" album - that also included a number of classic ARS performances. This tune starts off with a slow driving, melodic, and haunting feel and and moves quickly into a hard driving rock and roll tune with some awesome rhythmic backgrounds and world class solos. ARS has always featured great ensemble playing, but they can also be a great guitar jam band - and here you go! 4. Not Gonna Let it Bother Me - This classic hit off the "Champagne Jam" album features more tight ensemble playing and interplay along with lyrics that we can all relate too. 5. So Into You - Dean's signature keyboard work leads into one of ARS's biggest hits - and a tune that helped define the ARS sound to millions of people. From "A Rock and Roll Alternative," this tune spotlights Barry's amazing guitar work - always a high point. 6. Spooky - The Halloween song was a hit for both the Classic's IV and then ARS on "Underdog." The fact that ARS started off as top-notch studio session players comes through on this number - as Barry let's it wail, Dean steps right in and Steve brings it home. 7. Imaginary Lover - Fortunately, some things never change - and on this one, it all comes together with one of their biggest hits from "Champagne Jam." Andy gives it heart, Barry and Dean get to shine - it's another great jam. 8. Homesick - The show rocks to a close with this song from the "Quinella" album. On the country charts, this song also turned out to be a big hit for Travis Tritt - but it's a classic ARS tune that combines classic vocal work from Andy, strong harmonies from Steve, tight rythmic riffs from Barry, Steve and Justin, crisp organ work from Dean, and a hard driving beat provided by Jim. "The Atlanta Rhythm Section - Live at Stabler Arena "